This summer will see the graduation of the first student cohort to have experienced electronic submission and feedback throughout their time studying at Sussex. To mark this significant milestone, this blog post reflects on the story so far. Starting in 2014, members of staff from across many Schools and Professional Services have been working on the University’s e-submission and e-feedback (ESEF) project. This is a major university-wide initiative, delivering a step change in the systems and processes supporting assessment, marking and feedback. Formed as an active response to messages coming from students through the National Student Survey (NSS) and Students’ Union, the project recognised the need to transform and improve the quality and methods used for assessment and feedback. Three years later, Sussex is one of only a few universities1 to have established a fully automated end-to-end solution to facilitate the submission of student work, tutor marking, moderation of work (internal and external) and return of feedback. Since the launch of the new e-submission and e-feedback system at the start of the 2014/15 academic year, approximately 90,000 electronic submissions have been made by students and over 700 members of staff have received training and support from Technology Enhanced Learning. 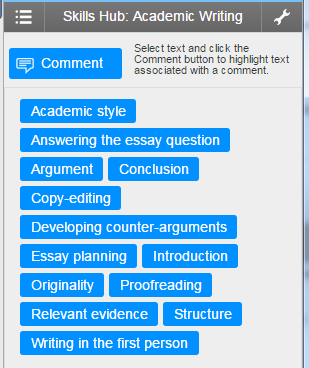 In that first year, the system was available for use purely with text-based assessments on level 4 (first year) undergraduate modules, via the Turnitin software, but it has continued to grow and develop year on year, in line with a plan to extend use and respond to feedback from staff and students. Please let us use e-submission and the Turnitin software as quickly as possible in the Masters courses. Not only will this help us teach students about academic integrity and reduce the incidence of plagiarism, it will help improve the marking process dramatically. (Anonymous, from the staff e-submission survey). For 2015/16, capacity was increased and a moderation workflow developed which allowed the system to be extended for use with level 3 (foundation) and level 5 (second year) module assessments. From this year, it is now possible to use e-submission and e-feedback across all levels of study at the university, with the inclusion of level 6 (third year), resits, and postgraduate module assessments where required. It would be helpful to submit portfolio pieces separately, rather than needing to copy and paste them into one document. (Anonymous, from the student e-submission survey). We have also extended the range and potential of assessment types by introducing Mahara, a digital portfolio system and also an alternative e-submission route which enables single or multiple files of any type or format to be submitted. In addition to a weekly training programme, Technology Enhanced Learning have supported staff to make the transition to online marking by providing extensive online guidance and resources, as well as assistance to develop discipline and school specific practices. Alongside these activities to support the transition in marking practice TEL have worked in collaboration with colleagues in the Library and Careers and Employability Centre who support study skills to create sets of reusable feedback comments (QuickMarks). These are available to all markers to use when providing feedback and provide a simple and accessible way to embed links to our existing online study skills resources into student feedback. The solution has been well received by staff and students alike. Students have commented on its ease of use, flexibility to support their studies and enhancement of the learning experience. It is an excellent tool. Saves paper, allows more flexibility in the student’s schedule, and the instructions are very easy to follow. Definitely improves the learning experience. (Anonymous, from the student e-submission survey). Another significant benefit has been the clarity and legibility of feedback through the presentation of typed comments. E-submission is much more convenient. feedback can actually be read as well! Sometimes I have found handwriting quite difficult to understand and so I didn’t know what actually was the correct answer. (Anonymous, from the student e-submission survey). Staff have commented that it has improved their working processes and given them the tools to provide students with more detailed and higher quality feedback. It has immeasurably improved my ability to respond to students work. I can offer more detailed and focused commentary, whilst saving time, and working more flexibly than with paper scripts. An excellent addition to the University experience for faculty and students. (Anonymous, from the staff e-submission survey). Along the way, some have been pleasantly surprised by the way it has transformed their work and ability to provide feedback. I was initially sceptical about the e-submission process as I’m not very confident with technology but found it user friendly and time saving and would favour e-submissions to paper submissions now. (Anonymous, from the staff e-submission survey). Despite the success of the project so far, and positive reception as reflected in the survey feedback, the project team is still busy and working actively to make the system even better. This summer will see the introduction of a new and improved interface for Turnitin, with the Grademark component updated and rebranded Feedback Studio, which will provide a range of enhancements to the marking and feedback process. For more information on our e-submission and e-feedback processes please see our online guidance and resources on the Technology Enhanced Learning website. ‹ Developing students’ discipline-specific vocabulary.